In the process of conversion rate optimization a store owner will sooner or later hit a wall with available Magento tools. While e-commerce tracking and cart abandonment information work great with Magento, checkout process is still a bit foggy area. 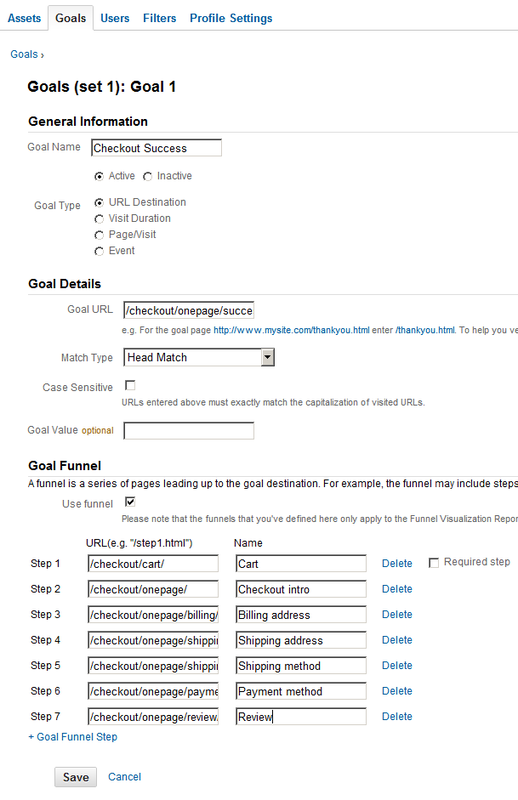 For this one we will use native Google Anlytics trackPageview method. Please note, this one works only with default Magento’s onepage checkout. [1.] If it’s not enabled, enable Google Analytics from Magento admin. Go to your Magento onepage checkout and watch for HTTP requests sent after each step/accordion is finished. If there is an HTTP request for __utm.gif after every checkout/accordion with appropriate parameters and their values (underlined) – then your data is being collected. While this method will not give you a definite answer to why people are abandoning eventual purchase, it might give you a better clue on what part of checkout process needs more of your attention, whether it’s overall checkout user experience (more information for each of the steps, etc.) or specific checkout options (shipping rates, available payment/shipping methods, etc). 100% conversion is due to step matching. If your steps are i.e. Do you have similar situation? After following this tutorial, we are seeing some activity on our funnel visualization, however I do not believe it is reporting accurately. According to our funnel, of the visitors that proceed to the Billing step, it is reported that 100% of them complete the funnel by placing an order. Obviously this is incorrect. Is anyone experiencing similar behavior? Any advice or help would be greatly appreciated. can you check/post you funnel steps report [screenshot would be best]? We removed shipping-fee from onepage checkout. We are using a different onepage checkout extension. Is it possible to set something similar to track the performance of that page? That seems to do the trick. But give it a little time to propagate. I am getting the same result as shaiju. Any sugguestions? I tried the same way whcih you mentioned as above. But the funnel conversion not getting properly. I would like to add my funnel converion’s screenshot too. Thanks for this tutorial. Big Help! It is working for me and reporting in analytics, but I have noticed that now after adding the script to the bottom of the onepage.phtml the checkout progress on the right column is not functioning as it should. Any ideas on how I can correct this? I will be removing the script from our main site until I can get this functioning in our dev environment. any help would be much appreciated. Another great tutorial by Inchoo 🙂 I wondered if anyone has managed to track the contact form enquiries as an analytics goal? Thanks! I did the changes like I said 08/21 in an comment but I didn’t have the informations about abandonment yet. Hi Guilerme, can you post screenshot from of reverse goal paths? All slashes are right and I changed the success URL to “head match”. I’ll monitor these Goal!